Oxford Plains Speedway, for several years, was a significant destination for me for varied reasons, on very different levels. For example, my first trip there and my last trip there were on my two honeymoons – one in 1969, and one in 1987. In between, there were several trips up from Milton, Vermont to watch the Oxford 250, under Press credentials from my other column in the late Speedway Scene. 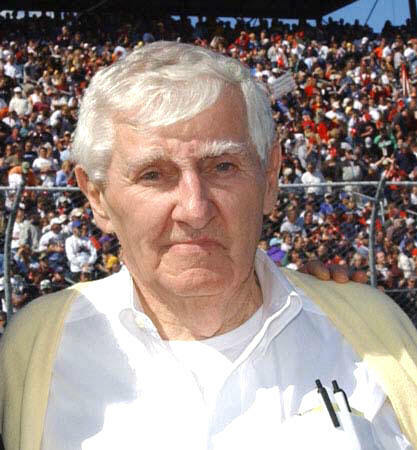 The track had been built by George Damon in 1950, having inherited the local racing from the old track further west at the Oxford County fairgrounds in South Paris. It had run on a somewhat successful basis until the bombastic, homespun entrepreneur Bob Bahre bought it and turned it into one of the most significant venues in the Northeast. operated from on Saturday nights. The most memorable OPS trip had to be the first, having traveled west, over Route 26, from our cottage on Little Sebago Lake, near Dry Mills, Maine. Despite the first wife’s absolute indifference [bordering on disdain] for racing, I was having a great time comparing OPS to my experiences at Catamount [which ,at that time, were only about a year’s worth]. 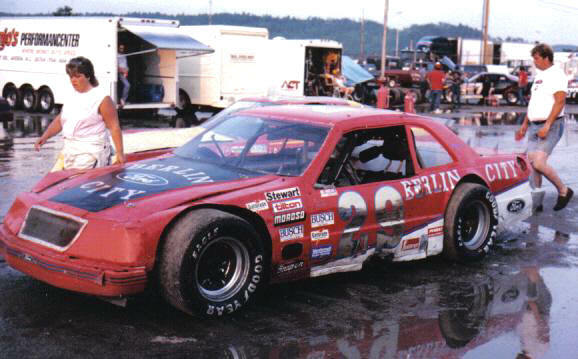 What struck me about the Plains was the fact that their late models seemed to be about a year advanced from ours down at Catamount. Maine drivers had already discovered the Mopar, and a few of their hot runners like Doug McDonald, of Jay, ME; Niles Gage, of Wilton; and Al Hammond, with the Tony Dipompo ride out of West Paris, were using Chrysler power as Catamount would really not until the next season. One of the mental images I was left with was of that striated area between the front stretch and the retaining wall, which was supposed to serve as a warning for drivers getting too far out of the groove. I noted certain drivers used it as a passing lane. annual Kora Temple night at Oxford Plains. I had never seen figure eight racing, and that was still largely dominated by Ray The Boulder Stone; however, other strong runners then included Willie Buffington, Jon Captain America Lizotte, and Don Bowie. Catamount was also a few years behind in bringing in mini stocks. Two guys who ran that day were Joe Hatch, from Sabattus and Herb Packard, from around Gray. But, by far and away, my faves at that program were the chargers, apparently in their first year as a division. From what I can glean from some old articles in the Lewiston paper, legendary Mike Rowe was a young driver in that class, chasing the eventual champion Stan Timberlake from Turner and George McKay, from Norway. The only way you could tell what kind of car each was driving was by the roof line – the rest was way too wrinkled up by August to tell. To this day, I remain impressed with the mature way the high points guys would patiently weave their way through huge fields of cars to end up near the front by the end of the 20 – lap feature. Names like Cloyd and Charlie Martin were in the field that night, as well. 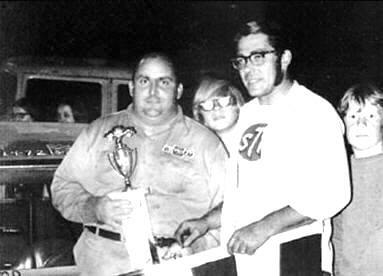 Tony DiPompo and Al Hammond share victory lane at OPS. Geoff Bodine, in the Zervakis 99, dices with Butch Lindley in the 1980 250. The last time at OPS was strictly by chance on my second honeymoon. My wife and I, earning our own livings quite well by that stage in our lives, had treated ourselves to a two-week vacation, mostly antiquing, in Maine. She was kind of groggy that late afternoon as we were driving east on Route 26, having been in places like Bryant Pond, Maine [the last place still using crank telephones]. When we had driven through South Paris, a bank sign thermometer was reading 113 degrees, and the heat had been killing her. This Thunderbird is probably what we saw that night on the honeymoon. When I saw traffic pulling into the track and I quickly mentioned having been there and she surprised me by wanting to attend. It turned out to be one of those Busch Grand National North events, so a lot of my acquaintances from Catamount would be running or spectating. The race was won handily by Dave Dion who, at that time, was splitting time between ACT and BGNN. I told Roxanne how Dave and I were good friends, how I had his daughter Michelle in my classroom a few years before, and all. She acted impressed, but I rather suspect she figured I was full of hot air. After the race, we went over to the infield where Dion was being interviewed up on one of those famous Bahre sandpiles near the front stretch. Dion paused between questions and happened to look over towards where we were standing. “Bill!”, he yelled, and he hopped off the sand pile and came over to hug both of us. Dave is just that kind of guy and always will be. OPS stalwarts in the track’s earlier pavement days. Oxford Plains has long since changed hands, changed divisions, and even sort of changed the nature of the 250 a bit; but it remains magic to me in so many ways. I won’t lose the image of the Bahres, conducting their affairs perched on a round cement base to one of the light poles. I can still recall seeing guys like Niles Gage, with the giant key sticking out of the trunk of his giant, late fifties Mopar. I will never see anything like the late Willie Wilson, a Hebron, ME logger, grabbing his car off a log truck the same way he would a big log. 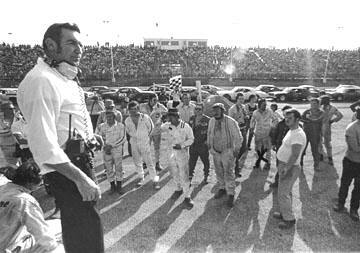 Oxford Plains, to me is a blur of 250 guest stars, the guy getting killed at the pit fence by Beaver Dragon’s brand new Laughlin car; Bob Morris sitting out in front of the stands in his wheel chair; local color like Frankie Perham leading the V-8’s with a six cylinder Valiant late model; the folksy announcer, Bob Walker; drivers of long standing – backbones of the track – like Stone, Bowie, Coolidge, Mason, the Martins, and dozens more. I think of sand, and more sand – surrounding the grounds and the really flat track. My friend, ACT official Marvin Galarneau appeared in many Oxford Plains articles from the 1960’s. I hope, if I ever happen upon Oxford Plains Speedway again, I can have another special occasion like every other time I ever went there.